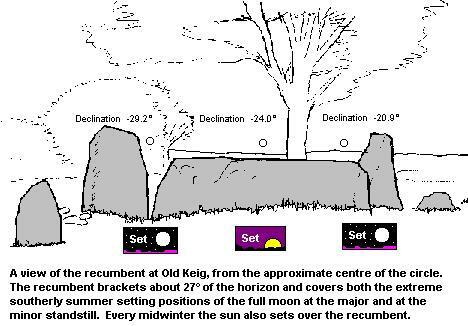 Old Keig - a description of the recumbent stone circle at Old Keig, Aberdeenshire, and its astronomical significance. How to find : Follow the B992 (Insch to Whitehouse road) to Keig. At the crossroads go north-west on the minor road for 2km. The site is visible in the trees on the left on the way up the hill. Park in the space opposite the trees, then walk about 250m down through this shelter belt to the site. Best time of year to visit : Lunar major and minor standstills. Winter solstice sunset. This stone circle site is special because the recumbent stone here is the largest known. It measures 5 metres long by two metres wide and two metres deep, and weighs all of 53 tons. No photograph can convey the impressiveness of this monument, despite its incompleteness. Apart from the wonder of the stone being pulled into position, a visitor will notice that the builders succeeded in setting this huge recumbent so that the top surface is perfectly horizontal. The two large flanking stones also survive in their original positions, but only one other stone of the circle remains in place. The circle was originally about 20 metres in diameter, and has an internal ring cairn. A dig into the centre of the ring cairn in the 18th century revealed nothing more than some burnt matter. A more scientific excavation by V. Gordon Childe in 1931 found that a great fire had burned in the middle of the circle. Then a pit had been dug in the centre which was filled with pottery sherds, charcoal and cremated bone. Such evidence, found at other sites, hints that the ring cairns were sactified by the addition of human remains, but were certainly not used primarily as burial areas. The recumbent is placed so that the midwinter sun sets over it as seen from the centre of the ring cairn. In addition, during the major standstill every 18.6 years the midsummer full moon sets over the left side of the recumbent ; at the minor standstill the midsummer full moon sets over the right side of the recumbent. The importance of the celestial positions to the builders of the monument must be reflected in the size and impressiveness of the recumbent and flankers themselves.